June 12, 2018 – Virginia-based technology company Relish, operator of RelishCareers (www.relishcareers.com), the hiring platform for graduate level job candidates and the companies that hire them, today announces the acquisition of Chicago-based TransparentCareer (www.transparentcareer.com), a career platform that provides personalized salary and culture data to job candidates. The acquisition will make RelishCareers the premier platform for firms seeking graduate level talent and targeted sourcing of experienced-hires, and will provide job candidates with an unprecedented level of detail in their career search. TransparentCareer, founded in 2016 out of the Booth School of Business at the University of Chicago, provides role-specific compensation and cultural data for students and alumni from top universities. With over 30,000 active users and data on over 7,000 employers, the TransparentCareer platform offers tremendous value for both job candidates and HR talent acquisition professionals. “Job candidates at the graduate level have a tremendous amount of information to process about the opportunities available to them, and the combination of these two platforms should provide those candidates with a really valuable, data-driven way to explore potential careers,” said Paul Reeder, Senior Director for Finance Careers at the Darden School of Business at the University of Virginia. 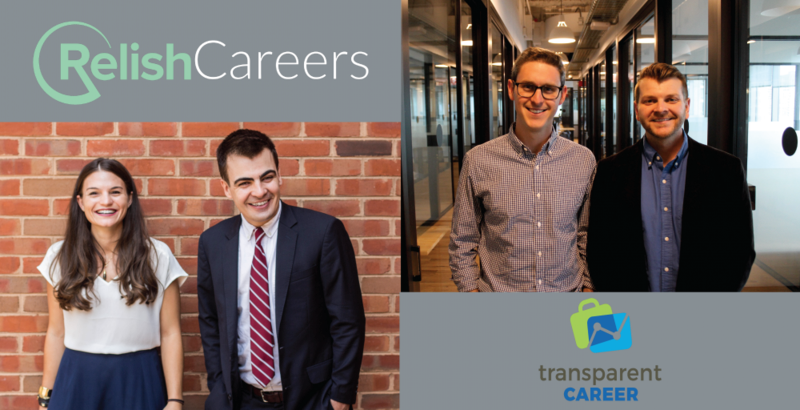 TransparentCareer is based out of Chicago, IL. Terms of the deal were not disclosed. Founded in 2014, RelishCareers is the hiring platform for graduate level business, data science and engineering candidates, and the search firm for experienced-hire candidates, specializing in leadership roles in Finance, Marketing, Operations, and Technology. RelishCareers combines high-tech recruiting through the online platform with high-touch staffing support to offer superior value to all stakeholders in the hiring process. RelishCareers strives to make the hiring process as user-friendly as possible for all stakeholders involved. Relish’s network includes over 400 universities globally, thousands of employers from early stage growth companies to the Fortune 500, including support for premier firms such as American Express, Under Armour, and Walmart. Founded in 2016, TransparentCareer is the next-generation career management platform for job seekers and employers. TransparentCareer is collecting the most robust compensation and career path dataset in existence to help professionals and students understand their fair pay and plan their careers. TransparentCareer provides compensation and career insights that are 1) personalized based on a user’s backgrounds and 2) longitudinal, allowing users to visualize how one choice might impact their career path over time. Transparent’s platform is used by half of all top MBA students in the United States along with the career offices of several business schools and multiple Fortune 500 companies.